ELERTS In 16 North American Transit Agencies; Secures Video Patent – ELERTS Corp.
2017 was a successful and busy year for ELERTS. It was full of impactful news and milestones as we continued to partner with new transit agencies such as SEPTA, DART, and Toronto’s TTC, helping them to make it easy for riders to adhere to the See Something Say Something initiative. We now count 16 transits as customers, and are helping to protect more passengers each day! In addition, we are thrilled to announce that the US Patent Office granted ELERTS an important security patent for our Attention Engine technology. ELERTS video surveillance innovation advances the state-of-the-art in video monitoring by instantly identifying cameras nearby an incident report sent by a mobile phone with location services. This invention solves the needle in the haystack problem of trying to figure out which camera to watch right now, when you have hundreds or thousands of cameras. ELERTS Attention Engine enables cameras to be used for real-time crime interception and enhanced situation awareness, versus simply storing video footage for after-the-incident forensic purposes. Unfortunately, 2017 did see a fair share of attacks and threats in airports and hotels. There is a growing demand for new, affordable technologies that can help airports to increase security and enhance public safety. We observed many situations where the power of crowdsourcing incident reporting made a difference in the outcome of bad situations. This underlines the importance of our mission. ELERTS is a valuable addition to the airport threat and security ecosystem. Whereas the use case for ELERTS See Say app at transit agencies involves passengers being the primary app users, at airports the app is targeted for use by badged airport employees, vendors and service providers who are most familiar with the airport and who recognize when something looks out of place or suspicious. In fact, we recently won Airport Security Shark Tank, judged by airport security experts. If you missed the news, you can read it all, here . In September, we announced a partnership with The California Hotel & Lodging Association (CH&LA) to provide CH&LA members with a state-of-the-art incident reporting & alerting solution that will allow hotel security directors and staff to report safety and security issues within seconds. The partnership complements a focus by the Association to help better prepare the hotel and lodging industry to address security situations that may arise within a property. 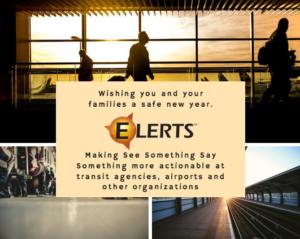 Overall, 2017 was a year of growth for ELERTS and we look forward to working with more transits, airports, schools and other organizations that can benefit from an emergency alert system app using the power and popularity of smartphones, and the value of crowdsourcing. Here’s to a safe 2018 for us all.